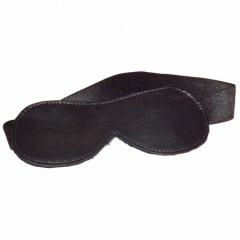 Black Leather Classic Blindfold with Comfortable Elastic Strap. This Classic Black Leather Blindfold is a staple and is a consistent best seller for great reason; it is amazingly comfortable and effective at blocking all light. It features a soft black fleece eye padding that keeps the wearer in complete darkness. The black bridle leather outer body has the wonderful strong aroma of fine leather, and a 1 1/4 inch black elastic strap has been incorporated for maximum comfort and to firmly hold the blindfold in place even in during hard scenes. This blindfold was designed to meet the demanding requirements of those that had wanted to design the perfect blindfold. Completely blocks out all light for the wearer. Comfortable and secure 1 1/2 inch elastic strap. Great smelling black Bridle leather body. The blindfold is 7 1/4 inches across It is just over 3 1/2 inches tall. The eye piece is lined with a ultra soft black fleece lining. The blindfold body is constructed of black heavy weight bridle leather and has a amazing leather aroma. It is held firmly in place with a comfortable 1 1/4 inch elastic strap with an off set binder so that is not under the head when one lays on it. Blindfolds are an essential ingredient for power exchange. They increase sexual tension, excitement, keep one guessing to what their top is going to do next and help the person wearing them to loose themselves in the moment by escaping the distractions that were ever present before they were blindfolded. This blindfold is virtually maintenance free. But if the eye piece becomes dirty it can be hand washed in a mild soap solution and rinsed, and then blown dry and fluffed with a hair dryer. The leather body is also care free, but can be conditioned with mink oil if needed.